"American Girls and American Girl Doll"
"Baby Girl in Party Dress"
metaphor contemporary art is pleased to present the exhibition; Rachelle Mozman; American Exurbia in the project space February 17 - March 19, 2006. Rachelle Mozman's photographs depict the private world of the newly developed and homogenous settings of American Exurbia. The series of portraits presented here in the project space weave document with narrative. The pictures represent mostly girls at home in New Jersey. Her subjects are shown as archetypes, and function as characters engaged within environments that due to their very banality and cool emptiness have deep impact on their subject - psyche and body. The culture represented is one of anxiety and distancing, and one in conflict with sensuality. Mozman works to gain the trust of her models engaging them in play in order to create a natural experience which she captures on film. She then subtly manipulates her photographs digitally, adding details and color in the surroundings while not altering the anatomy of the subjects themselves. 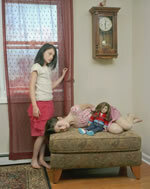 The resultant photographs exhibit an eerie and poignant existentialism. Hannah, depicts a young girl looking away from the camera with an ambiguous expression standing behind a blinded cat who directly engages the viewer. The high keyed red and blue colors seduce the viewer while the image subtly disturbs. What is the girl holding behind her back? Rachelle Mozman earned a BFA from Purchase College in 1994 and her MFA from Tyler School of Art in Philadelphia in 1998. She has received numerous awards for her photography including a Fulbright Fellowship Award to Panama, a Perkins Center for the Arts, Award for Artistic Excellence, First prize in Photo Review and a New Jersey State Council on the Arts Individual Artist Fellowship . Mozman's work has been exhibited in New York, New Jersey and Pennsylvania as well as being included in the 2005 Panama Biennial and Art Basel Miami.